"WIFI" redirects here. For the radio station, see WIFI (AM). Wi-Fi (/ˈwaɪfaɪ/) is a family of radio technologies that is commonly used for the wireless local area networking (WLAN) of devices which is based around the IEEE 802.11 family of standards. Wi‑Fi is a trademark of the Wi-Fi Alliance, which restricts the use of the term Wi-Fi Certified to products that successfully complete interoperability certification testing. Wi-Fi uses multiple parts of the IEEE 802 protocol family and is designed to seamlessly interwork with its wired sister protocol Ethernet. Devices that can use Wi-Fi technologies include desktops and laptops, video game consoles, smartphones and tablets, smart TVs, printers, digital audio players, digital cameras, cars and drones. Compatible devices can connect to each other over Wi-Fi through a wireless access point as well as to connected Ethernet devices and may use it to access the Internet. Such an access point (or hotspot) has a range of about 20 meters (66 feet) indoors and a greater range outdoors. Hotspot coverage can be as small as a single room with walls that block radio waves, or as large as many square kilometres achieved by using multiple overlapping access points. The different versions of Wi-Fi are specified by various IEEE 802.11 protocol standards, with the different radio technologies determining the ranges, radio bands, and speeds that may be achieved. Wi-Fi most commonly uses the 2.4 gigahertz (12 cm) UHF and 5 gigahertz (6 cm) SHF ISM radio bands; these bands are subdivided into multiple channels. Each channel can be time-shared by multiple networks. These wavelengths work best for line-of-sight. Many common materials absorb or reflect them, which further restricts range, but can tend to help minimise interference between different networks in crowded environments. At close range, some versions of Wi-Fi, running on suitable hardware, can achieve speeds of over 1 Gbit/s. Wi-Fi is potentially more vulnerable to attack than wired networks because anyone within range of a network with a wireless network interface controller can attempt access. Wi-Fi Protected Access (WPA) is a family of technologies created to protect information moving across Wi-Fi networks and includes solutions for personal and enterprise networks. Security features of WPA have included stronger protections and new security practices as the security landscape has changed over time. The name Wi-Fi, commercially used at least as early as August 1999, was coined by the brand-consulting firm Interbrand. The Wi-Fi Alliance had hired Interbrand to create a name that was "a little catchier than 'IEEE 802.11b Direct Sequence'." Phil Belanger, a founding member of the Wi-Fi Alliance who presided over the selection of the name "Wi-Fi", has stated that Interbrand invented Wi-Fi as a pun on the word hi-fi (high fidelity), a term for high-quality audio technology. The name Wi-Fi has no further meaning, and was never officially a shortened form of "Wireless Fidelity". Nevertheless, the Wi-Fi Alliance used the advertising slogan "The Standard for Wireless Fidelity" for a short time after the brand name was created, and the Wi-Fi Alliance was also called the "Wireless Fidelity Alliance Inc" in some publications. The name is sometimes written as WiFi, Wifi, or wifi, but these are not approved by the Wi-Fi Alliance. IEEE is a separate, but related, organization and their website has stated "WiFi is a short name for Wireless Fidelity". 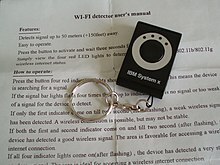 To connect to a Wi-Fi LAN, a computer has to be equipped with a wireless network interface controller. The combination of computer and interface controllers is called a station. Wi-Fi nodes operating in ad-hoc mode refers to devices talking directly to each other without the need to first talk to an access point (also known as base station). Ad-hoc mode was first invented and realized by Chai Keong Toh in his 1996 invention of Wi-Fi ad-hoc routing, implemented on Lucent WaveLAN 802.11a wireless on IBM ThinkPads over a size nodes scenario spanning a region of over a mile. The success was recorded in Mobile Computing magazine (1999) and later published formally in IEEE Transactions on Wireless Communications, 2002 and ACM SIGMETRICS Performance Evaluation Review, 2001. There are many different versions of Wi-Fi: 802.11a, 802.11b, 802.11g, 802.11n (Wi-Fi 4), 802.11h, 802.11i, 802.11-2007, 802.11-2012, 802.11ac (Wi-Fi 5), 802.11ad, 802.11af, 802.11-2016, 802.11ah, 802.11ai, 802.11aj, 802.11aq, 802.11ax (Wi-Fi 6), 802.11ay. Equipment frequently support multiple versions of Wi-Fi. To communicate, devices must use a common Wi-Fi version. The versions differ between the radio wavebands they operate on, the radio bandwidth they occupy, the maximum data rates they can support and other details. In general, lower frequencies have better range but have less capacity. Some versions permit the use of multiple antennas, which permits greater speeds as well as reduced interference. Historically, equipment has simply listed the versions of Wi-Fi using the name of the IEEE standard that it supports. The Wi-Fi alliance has standardised generational numbering so that equipment can indicate that it supports Wi-Fi 4 (if the equipment supports 802.11n), Wi-Fi 5 (802.11ac) and Wi-Fi 6 (802.11ax). These generations have a high degree of backward compatibility with previous versions. The alliance have stated that the generational level 4, 5, or 6 can be indicated in the user interface when connected, along with the signal strength. Wi-Fi technology may be used to provide Internet access to devices that are within the range of a wireless network that is connected to the Internet. The coverage of one or more interconnected access points (hotspots) can extend from an area as small as a few rooms to as large as many square kilometres. Coverage in the larger area may require a group of access points with overlapping coverage. For example, public outdoor Wi-Fi technology has been used successfully in wireless mesh networks in London. An international example is Fon. In 2005, St. Cloud, Florida and Sunnyvale, California, became the first cities in the United States to offer citywide free Wi-Fi (from MetroFi). Minneapolis has generated $1.2 million in profit annually for its provider. In May 2010, London mayor Boris Johnson pledged to have London-wide Wi-Fi by 2012. Several boroughs including Westminster and Islington  already had extensive outdoor Wi-Fi coverage at that point. Officials in South Korea's capital Seoul are moving to provide free Internet access at more than 10,000 locations around the city, including outdoor public spaces, major streets and densely populated residential areas. Seoul will grant leases to KT, LG Telecom, and SK Telecom. The companies will invest $44 million in the project, which was to be completed in 2015. Many traditional university campuses in the developed world provide at least partial Wi-Fi coverage. Carnegie Mellon University built the first campus-wide wireless Internet network, called Wireless Andrew, at its Pittsburgh campus in 1993 before Wi-Fi branding originated. By February 1997, the CMU Wi-Fi zone was fully operational. Many universities collaborate in providing Wi-Fi access to students and staff through the Eduroam international authentication infrastructure. The 802.11 standard provides several distinct radio frequencies ranges for use in Wi-FI communications: 900 MHz, 2.4 GHz, 5 GHz, 5.9 GHz, and 60 GHz bands. Each range is divided into a multitude of channels. Countries apply their own regulations to the allowable channels, allowed users and maximum power levels within these frequency ranges. The ISM band ranges are also often used. 802.11b/g/n can use the 2.4 GHz ISM band, operating in the United States under Part 15 Rules and Regulations. In this frequency band equipment may occasionally suffer interference from microwave ovens, cordless telephones, USB 3.0 hubs, and Bluetooth devices. A standard speed Wi-Fi signal occupies five channels in the 2.4 GHz band. Any two channel numbers that differ by five or more, such as 2 and 7, do not overlap. The oft-repeated adage that channels 1, 6, and 11 are the only non-overlapping channels is, therefore, not accurate. Channels 1, 6, and 11 are the only group of three non-overlapping channels in North America. However, channels that are four apart interfere a negligible amount, much less than reusing channels. In Europe and Japan where channel 13 is available, using Channels 1, 5, 9, and 13 for 802.11g and 802.11n is recommended. 802.11a/h/j/n/ac/ax can use the 5 GHz U-NII band, which, for much of the world, offers at least 23 non-overlapping 20 MHz channels rather than the 2.4 GHz ISM frequency band, where the channels are only 5MHz wide. The 5GHz bands are more strongly absorbed by common building materials, and usually give shorter range. As the 802.11 specifications evolved to support higher throughput, the bandwidth requirements also increased to support them. 802.11n can use double the radio spectrum/bandwidth (40 MHz- 8 channels) compared to 802.11a or 802.11g (20 MHz). 802.11n can also be set to limit itself to 20 MHz bandwidth to prevent interference in dense communities. In the 5 GHz band, 20, 40, 80 and 160 Mhz bandwidth signals are permitted with some restrictions, giving much faster connections. Wi-Fi is a technology considered to operate at the physical and data link layers of the OSI model, as part of the IEEE 802 protocol family. The data is organized into 802.11 frames that are very similar to Ethernet frames at the data link layer, but with extra address fields. MAC addresses are used as network addresses. Wi-Fi's MAC and physical layer (PHY) specifications are defined by IEEE 802.11 for modulating and receiving one or more carrier waves to transmit the data in the infrared, and 2.4, 3.6, 5, or 60 GHz frequency bands. They are created and maintained by the IEEE LAN/MAN Standards Committee (IEEE 802). The base version of the standard was released in 1997, and has had many subsequent amendments. The standard and amendments provide the basis for wireless network products using the Wi-Fi brand. While each amendment is officially revoked when it is incorporated in the latest version of the standard, the corporate world tends to market to the revisions because they concisely denote capabilities of their products. As a result, in the market place, each revision tends to become its own standard. In addition to 802.11 the IEEE 802 protocol family has specific provisions for Wi-Fi. These are required because Ethernet's cable-based media are not usually shared, whereas with wireless all transmissions are received by all stations within range that employ that radio channel. While Ethernet has essentially negligible error rates, wireless communication media are subject to significant interference. Therefore accurate transmission is not guaranteed so delivery is therefore a best-effort delivery mechanism. Because of this, for Wi-Fi, the Logical Link Control (LLC) specified by IEEE 802.2 employs Wi-Fi's media access control (MAC) protocols to manage retries without relying on higher levels of the protocol stack. Wi-Fi operational range depends on factors such as the frequency band, radio power output, receiver sensitivity, antenna gain and antenna type as well as the modulation technique. In addition, propagation characteristics of the signals can have a big impact. Compared to cell phones and similar technology, Wi-Fi transmitters are low power devices. In general, the maximum amount of power that a Wi-Fi device can transmit is limited by local regulations, such as FCC Part 15 in the US. Equivalent isotropically radiated power (EIRP) in the European Union is limited to 20 dBm (100 mW). To reach requirements for wireless LAN applications, Wi-Fi has higher power consumption compared to some other standards designed to support wireless personal area network (PAN) applications. For example, Bluetooth provides a much shorter propagation range between 1 and 100m and so in general have a lower power consumption. Other low-power technologies such as ZigBee have fairly long range, but much lower data rate. The high power consumption of Wi-Fi makes battery life in some mobile devices a concern. An access point compliant with either 802.11b or 802.11g, using the stock omnidirectional antenna might have a range of 100 m (0.062 mi). The same radio with an external semi parabolic antenna (15 dB gain) with a similarly equipped receiver at the far end might have a range over 20 miles. Higher gain rating (dBi) indicates further deviation (generally toward the horizontal) from a theoretical, perfect isotropic radiator, and therefore the antenna can project a usable signal further in particular directions, as compared to a similar output power on a more isotropic antenna. For example, an 8 dBi antenna used with a 100 mW driver will have a similar horizontal range to a 6 dBi antenna being driven at 500 mW. Note that this assumes that radiation in the vertical is lost; this may not be the case in some situations, especially in large buildings or within a waveguide. In the above example, a directional waveguide could cause the low power 6 dBi antenna to project much further in a single direction than the 8 dBi antenna which is not in a waveguide, even if they are both being driven at 100 mW. On wireless routers with detachable antennas, it is possible to improve range by fitting upgraded antennas which have higher gain in particular directions. Outdoor ranges can be improved to many kilometers through the use of high gain directional antennas at the router and remote device(s). 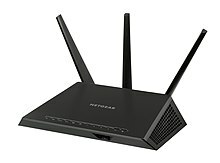 This Netgear Wi-Fi router contains dual bands for transmitting the 802.11 standard across the 2.4 and 5 GHz spectrums and supports MIMO. Some standards, such as IEEE 802.11n and IEEE 802.11ac for Wi-Fi allow a device to have multiple antennas. Multiple antennas enable the equipment to focus on the far end device, reducing interference in other directions, and giving a stronger useful signal. This greatly increases range and network speed without exceeding the legal power limits. IEEE 802.11n can more than double the range. Range also varies with frequency band. Wi-Fi in the 2.4 GHz frequency block has slightly better range than Wi-Fi in the 5 GHz frequency block used by 802.11a (and optionally by 802.11n). Under optimal conditions, IEEE 802.11ac can achieve communication rates of 1Gbit/s. With Wi-Fi signals line-of-sight usually works best, signals can transmit, absorb, reflect, and diffract through and around structures. Mobile use of Wi-Fi over wider ranges is limited, for instance, to uses such as in an automobile moving from one hotspot to another. Other wireless technologies are more suitable for communicating with moving vehicles. Wi-Fi connections can be disrupted or the Internet speed lowered by having other devices in the same area. Wi-Fi protocols are designed to share channels reasonably fairly, and will often work with little to no disruption. However, many 2.4 GHz 802.11b and 802.11g access-points default to the same channel on initial startup, contributing to congestion on certain channels. Wi-Fi pollution, or an excessive number of access points in the area, can prevent access and interfere with other devices' use of other access points as well as with decreased signal-to-noise ratio (SNR) between access points. In addition interference can be caused by overlapping channels in the 802.11g/b spectrum. These issues can become a problem in high-density areas, such as large apartment complexes or office buildings with many Wi-Fi access points. Wi-Fi 6 has greatly improved power control, and suffers less from interference in congested areas. Other devices use the 2.4 GHz band: microwave ovens, ISM band devices, security cameras, ZigBee devices, Bluetooth devices, video senders, cordless phones, baby monitors, and, in some countries, amateur radio, all of which can cause significant additional interference. It is also an issue when municipalities or other large entities (such as universities) seek to provide large area coverage. To minimise collisions with Wi-Fi and non Wi-Fi devices, Wi-Fi employs Carrier-sense multiple access with collision avoidance (CSMA/CA), where transmitters listen before transmitting, and delay transmission of packets if they detect that other users are active on the channel. Nevertheless Wi-Fi networks are still susceptible to the hidden node and exposed node problem. These bands are allowed to be used with low power transmitters, without requiring a license and with few restrictions. However, while unintended interference is common, users that have been found to knowingly cause deliberate interference to other users (particularly for attempting to locally monopolise these bands for commercial purposes) have been handed large fines. Various layer 2 variants of IEEE 802.11 has different characteristics. Across all flavours of 802.11, maximum achievable throughputs are either given based on measurements under ideal conditions or in the layer 2 data rates. This, however, does not apply to typical deployments in which data are being transferred between two endpoints of which at least one is typically connected to a wired infrastructure and the other endpoint is connected to an infrastructure via a wireless link. Other factors which contribute to the overall application data rate are the speed with which the application transmits the packets (i.e. the data rate) and the energy with which the wireless signal is received. The latter is determined by distance and by the configured output power of the communicating devices. 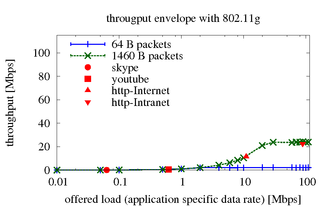 The same references apply to the attached throughput graphs which show measurements of UDP throughput measurements. Each represents an average throughput of 25 measurements (the error bars are there, but barely visible due to the small variation), is with a specific packet size (small or large), and with a specific data rate (10 kbit/s – 100 Mbit/s). Markers for traffic profiles of common applications are included as well. This text and measurements do not cover packet errors but information about this can be found at the above references. The table below shows the maximum achievable (application specific) UDP throughput in the same scenarios (same references again) with various different WLAN (802.11) flavours. The measurement hosts have been 25 meters apart from each other; loss is again ignored. Increasing the number of Wi-Fi access points for a network provides redundancy, better range, support for fast roaming and increased overall network-capacity by using more channels or by defining smaller cells. Except for the smallest implementations (such as home or small office networks), Wi-Fi implementations have moved toward "thin" access points, with more of the network intelligence housed in a centralized network appliance, relegating individual access points to the role of "dumb" transceivers. Outdoor applications may use mesh topologies. An Extended Service Set may be formed by deploying multiple access points that are configured with the same SSID and security settings. Wi-Fi client devices will typically connect to the access point that can provide the strongest signal within that service set. Wi-Fi allows wireless deployment of local area networks (LANs). Also, spaces where cables cannot be run, such as outdoor areas and historical buildings, can host wireless LANs. However, building walls of certain materials, such as stone with high metal content, can block Wi-Fi signals. Since the early 2000s, manufacturers are building wireless network adapters into most laptops. The price of chipsets for Wi-Fi continues to drop, making it an economical networking option included in even more devices. An AirPort wireless G Wi-Fi adapter from an Apple MacBook. Wireless routers integrate a Wireless Access Point, Ethernet switch, and internal router firmware application that provides IP routing, NAT, and DNS forwarding through an integrated WAN-interface. A wireless router allows wired and wireless Ethernet LAN devices to connect to a (usually) single WAN device such as a cable modem, DSL modem or optical modem. A wireless router allows all three devices, mainly the access point and router, to be configured through one central utility. This utility is usually an integrated web server that is accessible to wired and wireless LAN clients and often optionally to WAN clients. This utility may also be an application that is run on a computer, as is the case with as Apple's AirPort, which is managed with the AirPort Utility on macOS and iOS. Wireless network bridges can act to connect two networks to form a single network at the data-link layer over Wi-Fi. The main standard is the wireless distribution system (WDS). Wireless bridging can connect a wired network to a wireless network. A bridge differs from an access point: an access point typically connects wireless devices to one wired network. Two wireless bridge devices may be used to connect two wired networks over a wireless link, useful in situations where a wired connection may be unavailable, such as between two separate homes or for devices which do not have wireless networking capability (but have wired networking capability), such as consumer entertainment devices; alternatively, a wireless bridge can be used to enable a device which supports a wired connection to operate at a wireless networking standard which is faster than supported by the wireless network connectivity feature (external dongle or inbuilt) supported by the device (e.g. enabling Wireless-N speeds (up to the maximum supported speed on the wired Ethernet port on both the bridge and connected devices including the wireless access point) for a device which only supports Wireless-G). A dual-band wireless bridge can also be used to enable 5 GHz wireless network operation on a device which only supports 2.4 GHz wireless networking functionality and has a wired Ethernet port. Wireless range-extenders or wireless repeaters can extend the range of an existing wireless network. Strategically placed range-extenders can elongate a signal area or allow for the signal area to reach around barriers such as those pertaining in L-shaped corridors. 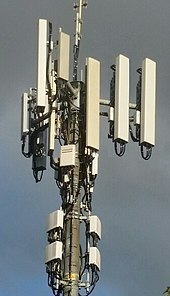 Wireless devices connected through repeaters will suffer from an increased latency for each hop, and there may be a reduction in the maximum available data throughput. In addition, the effect of additional users using a network employing wireless range-extenders is to consume the available bandwidth faster than would be the case whereby a single user migrates around a network employing extenders. For this reason, wireless range-extenders work best in networks supporting low traffic throughput requirements, such as for cases whereby a single user with a Wi-Fi equipped tablet migrates around the combined extended and non-extended portions of the total connected network. Also, a wireless device connected to any of the repeaters in the chain will have a data throughput that is limited by the "weakest link" existing in the chain between where the connection originates and where the connection ends. Networks employing wireless extenders are more prone to degradation from interference from neighboring access points that border portions of the extended network and that happen to occupy the same channel as the extended network. 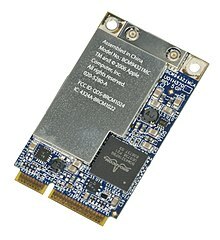 Wireless network interface controller Gigabyte GC-WB867D-I. Antenna of wireless network interface controller Gigabyte GC-WB867D-I. The more secure WPA2 using Advanced Encryption Standard was introduced in 2004 and is supported by most new Wi-Fi devices. WPA2 is fully compatible with WPA. In 2017, a flaw in the WPA2 protocol was discovered, allowing a key replay attack, known as KRACK. Wi-Fi Protected Access encryption (WPA2) is considered secure, provided a strong passphrase is used. In 2018, WPA3 was announced as a replacement for WPA2, increasing security; it rolled out on June 26. Recreational logging and mapping of other people's access points has become known as wardriving. Indeed, many access points are intentionally installed without security turned on so that they can be used as a free service. Providing access to one's Internet connection in this fashion may breach the Terms of Service or contract with the ISP. These activities do not result in sanctions in most jurisdictions; however, legislation and case law differ considerably across the world. A proposal to leave graffiti describing available services was called warchalking. Piggybacking often occurs unintentionally – a technically unfamiliar user might not change the default "unsecured" settings to their access point and operating systems can be configured to connect automatically to any available wireless network. A user who happens to start up a laptop in the vicinity of an access point may find the computer has joined the network without any visible indication. Moreover, a user intending to join one network may instead end up on another one if the latter has a stronger signal. In combination with automatic discovery of other network resources (see DHCP and Zeroconf) this could possibly lead wireless users to send sensitive data to the wrong middle-man when seeking a destination (see man-in-the-middle attack). For example, a user could inadvertently use an unsecure network to log into a website, thereby making the login credentials available to anyone listening, if the website uses an unsecure protocol such as plain HTTP without TLS. The World Health Organization (WHO) says, "no health effects are expected from exposure to RF fields from base stations and wireless networks", but notes that they promote research into effects from other RF sources. Although the WHO's International Agency for Research on Cancer (IARC) later classified radio-frequency electromagnetic fields (EMFs) as "possibly carcinogenic to humans (Group 2B)" (a category used when "a causal association is considered credible, but when chance, bias or confounding cannot be ruled out with reasonable confidence"), this classification was based on risks associated with wireless phone use rather than Wi-Fi networks. A review of studies involving 725 people who claimed electromagnetic hypersensitivity, "...suggests that 'electromagnetic hypersensitivity' is unrelated to the presence of an EMF, although more research into this phenomenon is required." ^ Garber, Megan (2014-06-23). "'Why-Fi' or 'Wiffy'? How Americans Pronounce Common Tech Terms". The Atlantic. Archived from the original on 2018-06-15. ^ Beal, Vangie. "What is Wi-Fi (IEEE 802.11x)? A Webopedia Definition". Webopedia. out will a smaller size and a wireless connection system year unknown due to destuction of files but the year is was used for customer use was 2005. edia.com/term/w/wi_fi.html Archived Check |archiveurl= value (help) from the original on 2012-03-08. ^ "Certification". Wi-Fi Alliance. Retrieved 23 April 2019. ^ Greenwood, Ross (November 3, 2014). "So just what's the big idea anyway?". news.com.au. Archived from the original on November 7, 2015. ^ Mercer, Phil (August 11, 2012). "Wi-fi, dual-flush loos and eight more Australian inventions". BBC News Magazine. Archived from the original on January 2, 2016. ^ "WATCH: 5G WiFi Will Help Integrate Wireless Networking Into Everyday Lives". Huffington Post. 2013-10-16. Archived from the original on 31 December 2016. Retrieved 11 June 2017. ^ "European Inventor Award: High-speed wireless networking". European Patent Office. Archived from the original on 13 June 2017. Retrieved 11 June 2017. ^ "World changing Aussie inventions". Australian Geographic. Archived from the original on 2011-12-15. ^ Mullin, Joe (2012-04-04). "How the Aussie government "invented WiFi" and sued its way to $430 million". Ars Technica. Archived from the original on 2012-05-08. ^ Popper, Ben (2010-06-03). "Australia's Biggest Patent Troll Goes After AT&T, Verizon and T-Mobile". CBS News. Archived from the original on 2013-05-06. ^ Schubert, Misha (2012-03-31). "Australian scientists cash in on Wi-Fi invention". The Sydney Morning Herald. Archived from the original on 2012-04-01. ^ "CSIRO wins legal battle over wi-fi patent". ABC News. April 1, 2012. ^ a b Doctorow, Cory (2005-11-08). "WiFi isn't short for "Wireless Fidelity"". Boing Boing. Archived from the original on 2012-12-21. Retrieved 2012-12-21. ^ Graychase, Naomi (2007-04-27). "'Wireless Fidelity' Debunked". Wi-Fi Planet. Archived from the original on 2007-09-28. Retrieved 2007-08-31. ^ Pogue, David (2012-05-01). "What Wi-Fi Stands for—and Other Wireless Questions Answered". Scientific American. Archived from the original on 2016-11-16. Retrieved 2016-11-15. ^ Aime, Marco; Calandriello, Giorgio; Lioy, Antonio (2007). "Dependability in Wireless Networks: Can We Rely on WiFi?". IEEE Security and Privacy Magazine. 5 (1): 23–29. doi:10.1109/MSP.2007.4. ^ Toh, C.-K; Delwar, M.; Allen, D. (2002-08-07). "Evaluating the Communication Performance of an Ad Hoc Mobile Network". IEEE Transactions on Wireless Communications. 1 (3): 402–414. doi:10.1109/TWC.2002.800539. ^ Toh, C.-K; Chen, Richard; Delwar, Minar; Allen, Donald (2001). "Experimenting with an Ad Hoc Wireless Network on Campus: Insights & Experiences". ACM SIGMETRICS Performance Evaluation Review. 28 (3): 21–29. doi:10.1145/377616.377622. ^ Kerr, Dana (2013-05-27). "Google said to deploy Wi-Fi blimps in Africa and Asia". CNET. Archived from the original on 2017-03-14. ^ Verma, Veruna (2006-08-20). "Say Hello to India's First Wirefree City". The Telegraph. Archived from the original on 2012-01-20. ^ "Sunnyvale Uses Metro Fi" (in Turkish). besttech.com.tr. Archived from the original on July 22, 2015. ^ Alexander, Steve; Brandt, Steve (December 5, 2010). "Minneapolis moves ahead with wireless". The Star Tribune. Archived from the original on December 9, 2010. ^ Bsu, Indrajit (2007-05-14). "City of London Fires Up Europe's Most Advanced Wi-Fi Network". Digital Communities. Archived from the original on 2008-09-07. Retrieved 2007-05-14. ^ "Seoul Moves to Provide Free City-Wide WiFi Service". Voice of America. 2011-06-15. Archived from the original on 2012-11-10. Retrieved 2012-04-01. ^ Smit, Deb (October 5, 2011). "How Wi-Fi got its start on the campus of CMU, a true story". Pop City. Archived from the original on October 7, 2011. Retrieved October 6, 2011. ^ Lemstra, Wolter; Hayes, Vic; Groenewegen, John (2010). The Innovation Journey of Wi-Fi: The Road to Global Success. Cambridge University Press. p. 121. ISBN 978-0-521-19971-1. Archived from the original on November 12, 2012. Retrieved October 6, 2011. ^ Subash (2011-01-24). "Wireless Home Networking with Virtual WiFi Hotspot". Techsansar. Archived from the original on 2011-08-30. Retrieved 2011-10-14. ^ Cox, John (2009-10-14). "Wi-Fi Direct allows device-to-device links". Network World. Archived from the original on 2009-10-23. ^ "What is Wi-Fi Certified TDLS?". Wi-Fi Alliance. Archived from the original on 2014-11-08. ^ "Wi-Fi Channels, Frequencies, Bands & Bandwidths". Radio-Electronics.com. Archived from the original on 2018-02-16. Retrieved 2018-08-18. ^ "IEEE 802.11-2007: Wireless LAN Medium Access Control (MAC) and Physical Layer (PHY) specifications". IEEE Standards Association. 8 March 2007. Archived from the original on 2007-04-18. ^ Mitchell, Bradley (2018-10-03). "802.11 WiFi Standards Explained". Lifewire. Archived from the original on 2018-12-12. Retrieved 2018-08-18. ^ Herman, John (2010-09-07). "Why Everything Wireless Is 2.4 GHz". Wired. Archived from the original on 2014-06-12. Retrieved 2018-08-18. ^ "802.11n Data Rates Dependability and scalability". Cisco. Archived from the original on 2017-07-05. Retrieved 2017-11-20. ^ Stobing, Chris (2015-11-17). "What Does WiFi Stand For and How Does Wifi Work?". GadgetReview. Archived from the original on December 1, 2015. Retrieved November 18, 2015. ^ Geier, Jim (2001-12-06). Overview of the IEEE 802.11 Standard. InformIT. Archived from the original on 20 April 2016. Retrieved 8 April 2016. ^ Kanellos, Michael (2007-06-18). "Ermanno Pietrosemoli has set a new record for the longest communication Wi-Fi link". Archived from the original on 2008-03-21. Retrieved 2008-03-10. ^ Toulouse, Al (2006-06-02). "Wireless technology is irreplaceable for providing access in remote and scarcely populated regions". Association for Progressive Communications. Archived from the original on 2009-02-02. Retrieved 2008-03-10. ^ Pietrosemoli, Ermanno (2007-05-18). 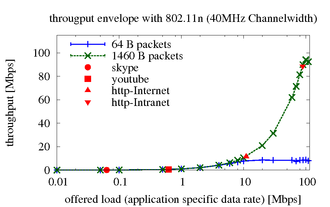 "Long Distance WiFi Trial" (PDF). Archived (PDF) from the original on 2016-03-05. Retrieved 2008-03-10. ^ Gold, Jon (2016-06-29). "802.11ac Wi-Fi head driving strong WLAN equipment sales". Network World. Archived from the original on 2017-08-27. Retrieved 2017-05-19. ^ Caravan, Delia (2014-09-12). "6 Easy Steps To Protect Your Baby Monitor From Hackers". Baby Monitor Reviews HQ. Archived from the original on 2014-10-18. Retrieved 2014-09-12. ^ Wilson, Tracy V. (2006-04-17). "How Municipal WiFi Works". HowStuffWorks. Archived from the original on 2008-02-23. Retrieved 2008-03-12. ^ Chakraborty, Sandip; Nandi, Sukumar; Chattopadhyay, Subhrendu (2015-09-22). "Alleviating Hidden and Exposed Nodes in High-Throughput Wireless Mesh Networks". IEEE Transactions on Wireless Communications. 15 (2): 928–937. doi:10.1109/TWC.2015.2480398. ^ Brown, Bob (2016-03-10). "Wi-Fi hotspot blocking persists despite FCC crackdown". Network World. Archived from the original on 2019-02-27. ^ "Towards Energy-Awareness in Managing Wireless LAN Applications". IEEE/IFIP NOMS 2012: IEEE/IFIP Network Operations and Management Symposium. Retrieved 2014-08-11. ^ "Application Level Energy and Performance Measurements in a Wireless LAN". The 2011 IEEE/ACM International Conference on Green Computing and Communications. Retrieved 2014-08-11. ^ "Free WiFi Analyzer-Best Channel Analyzer Apps For Wireless Networks". The Digital Worm. 2017-06-08. Archived from the original on 2017-08-08. ^ "GainSpan low-power, embedded Wi-Fi". www.gainspan.com. Archived from the original on 2010-06-30. Retrieved 2017-06-17. ^ Jensen, Joe (2007-10-26). "802.11 X Wireless Network in a Business Environment – Pros and Cons". Networkbits. Archived from the original on 2008-03-05. Retrieved 2008-04-08. ^ Higgs, Larry (2013-07-01). "Free Wi-Fi? User beware: Open connections to Internet are full of security dangers, hackers, ID thieves". Asbury Park Press. Archived from the original on 2013-07-02. ^ Gittleson, Kim (2014-03-28). "Data-stealing Snoopy drone unveiled at Black Hat". BBC News. Archived from the original on 2014-03-30. Retrieved 2014-03-29. ^ Mateti, Prabhaker (2005). "Hacking Techniques in Wireless Networks". Dayton, Ohio: Wright State University Department of Computer Science and Engineering. Archived from the original on 2010-03-05. Retrieved 2010-02-28. ^ Hegerle, Blake; snax; Bruestle, Jeremy (2001-08-17). "Wireless Vulnerabilities & Exploits". wirelessve.org. Archived from the original on 2006-09-19. Retrieved 2008-04-15. ^ "WPA2 Security Now Mandatory for Wi-Fi CERTIFIED Products". Wi-Fi Alliance. 2006-03-13. Archived from the original on 2011-08-25. ^ Vanhoef, Mathy (2017). "Key Reinstallation Attacks: Breaking WPA2 by forcing nonce reuse". Archived from the original on 2017-10-22. Retrieved 2017-10-21. ^ Goodin, Dan (2017-10-16). "Serious flaw in WPA2 protocol lets attackers intercept passwords and much more". Ars Technica. Archived from the original on 2017-10-21. Retrieved 2017-10-21. ^ Thubron, Rob (2018-01-09). "WPA3 protocol will make public Wi-Fi hotspots a lot more secure". Techspot. Archived from the original on 2018-11-16. ^ Kastrenakes, Jacob (2018-06-26). "Wi-Fi security is starting to get its biggest upgrade in over a decade". The Verge. Archived from the original on 2019-02-20. Retrieved 2018-06-26. ^ Jones, Matt (2002-06-24). "Let's Warchalk" (PDF). Archived from the original (PDF) on 2008-07-05. Retrieved 2008-10-09. ^ "IARC Classifies Radiofrequency Electromagnetic Fields as Possibly Carcinogenic to Humans" (PDF). International Agency for Research on Cancer. 2011-05-31. Archived (PDF) from the original on 2012-04-10. Retrieved 2016-05-28. ^ Rubin, G.; Das Munshi, Jayati; Wessely, Simon (2005-03-01). "Electromagnetic Hypersensitivity: A Systematic Review of Provocation Studies". Psychosomatic Medicine. 67 (2): 224–32. CiteSeerX 10.1.1.543.1328. doi:10.1097/01.psy.0000155664.13300.64. PMID 15784787. The WNDW Authors (1 March 2013). Butler, Jane (ed.). Wireless Networking in the Developing World (Third Edition). ISBN 978-1-4840-3935-9. This page was last edited on 23 April 2019, at 15:20 (UTC).